Neoliberal Professor J.Bradford DeLong admits that deregulation of the financial sector during the 1990's was a bad idea. An excerpt: "It may even be the case that we ought to return to the much more tightly regulated financial system of the first post-World War II generation. That system served the industrial core well, at least as far as we can tell from the macroeconomic aggregates. We know for certain that our more recent system has not". It is amazing that the word 'may' is included in the above excerpt and not the word "should'. Treasury Secretary Timothy F. Geithner has signaled to White House officials that he’s considering leaving the administration after PresidentBarack Obama reaches an agreement with Congress to raise the national debt limit, according to three people familiar with the matter. Geithner hasn’t made a final decision and won’t do so until the debt ceiling issue has been resolved, according to one of the people. All spoke on condition of anonymity to talk about private discussions. That would be two down with Larry Summers gone. UPDATE: Geithner denies the rumor. It's getting crazier out there. I'm sick of hearing all this B.S. dogma about keeping tax rates low to incentivize production. From 1945 - 1980, when top tax rates ranged from 91% to 71%, industrial production grew 225% in America. Since Reagan through today, when top tax rates were brought down dramatically, industrial production grew 77%. This thing about taxes is just a bunch of bull. I am not for higher taxes; that's not what the economy needs right now, but seriously, it's just a B.S. argument. Corruption Watch: What would it cost to buy Congress back and end corruption? Charles Hugh Smith at Of Two Minds asks, How Much Would It Cost To Buy Congress Back From Special Interests? He does the numbers and and estimates about 14 billion, with the president thrown in (veto power, you know). Anyone that has been following Bill Black, Yves Smith, Janet Tavakoli, and others exposing corruption knows that it is endemic to the degree of becoming institutionalized and legalized, with very little push back and those who do push back face confrontation from powerful forces. This takes it to an new level, however — intimidation and murder. Bill Gross Goes All In: "Who will buy them now?" Today is the last day for the Fed's open market operations known as "QE2", so Gross apparently took this opportunity to re-emphasize his current position that no one will buy Treasury bonds once the Fed stops. I think bonds are actually going to rally once the Fed exits this marketplace, as they have been acting as a deep-pocketed scale-down buyer, in a market where there has been much speculative selling. Fed extends dollar swap lines to foreign central banks--AGAIN! The Fed is at it again. This is like the fourth or fifth time in the past three years that the Fed has come to the rescue of foreign banking institutions and corporations. By instituting dollar swap lines the Fed provides dollar based liquidity to foreigners who are short dollars and need to make good on their dollar denominated obligations. In return the Fed assumes unlimited risk on this position. The Fed doesn't have to do this. Central banks of these respective countries and trade zones could provide dollars buy selling their domestic currencies and buying dollars in the foreign exchange markets. But, heaven forbid, that would mean weakening their currencies and making the dollar stronger! So instead of doing that the Fed REMOVES that potentially huge dollar bid. And this comes from Bernanke, who recently talked about wanting a strong dollar??? Unbelievable. Most shocking, however, is the fact that there is no outcry from Congress or any policymaker that has been complaining about the weakness of the buck. None whatsoever. Where are they? One of the many consequences of boomer demographics is the longer the US opus of reform of Medicare, and Social Security, the more difficult it will become because of voting demographics. Republicans are already learning that from the negative reaction to the Ryan Plan — after they all signed onto it. This is a plus from the MMT perpsective, since there is no reason to cut social services due to "affordability," when the only constraint is availability of real resources. How to allocate real resources is a political decision, however, and the demographics suggest that the boomers will have the upper hand at the voting booth. Catherine Rampell at The New York Times: Could Obama Just Ignore the Debt Ceiling? Beowulf has already told us some time ago that the Supreme Court decided that Congress does not have the authority to renege on obligations previously entered into on behalf of the United States. See Perry V. United States, 294 U. S. 330 (1935). Now do the spineless Democrats have the spine to do this? That question answers itself. Martin Wolf has an interesting post from the MMT perspective today in his column at The Financial Times. Now turn to the yet more debated question of fiscal policy. The question I have is this: does the BIS know that every sector cannot run financial surpluses at the same time? Few doubt there is excessive private sector debt in a number of high-income countries. But how is it to be reduced? The BIS notes four answers: repayment; default; higher real incomes; and inflation. Let us rule out the last and focus on the first. Repayment means spending less than one’s income. That is what is happening in the US private sector (see chart). Households ran a financial deficit (an excess of spending over income) of 3.5 per cent of gross domestic product in the third quarter of 2005. This had shifted to a surplus of 3.3 per cent in the first quarter of 2011. The business sector is also running a modest surplus. Since the US has a current account deficit, the rest of the world is also, by definition, spending less than its income. Who is taking the opposite side? The answer is: the government. This is what a controlled depression means: every sector, other than the government, is seeking to strengthen its balance sheet at the same time. The BIS insists this is not good enough: highly leveraged countries are running structural fiscal deficits, which must be eliminated as soon as possible. Fair enough, but where are the offsetting adjustments to occur? Read the whole post at Why austerity alone risks a disaster. I posted a comment there commending him. Consider lending your support, too. Euro MP Farage: "What is Plan 'B' For the Eurozone?" Recent video from the RT of British MEP Nigel Farage on the current situation in the Eurozone. Evidence that at least some politicians in Europe have an independent, skeptical and objective view of the current situation and are asking some important questions. What is the American Dream? : Dueling dualities in the American tradition by James Gustave Speth at New Deal 2.0 examines a key philosophical and normative fundamental that is central to the conception of economics, especially as it relates to policy formulation. It is worth a read in entirety. I intend to address these issues in future posts, since it involves the philosophical foundations of economics. It is evident that both national security and a legal system based on order and justice are prerequisites preserving life and liberty, and that a democratically elected government responsible to the people is required to ensure that the benefits of good government are extended to all. But the meaning of "the pursuit of happiness" is less clear. Speth lays out the different visions of happiness that have shaped political interpretation of it. This is key for macroeconomics, especially, since it deals with government as a key economic factor. Accordingly, the conception of the purpose of both life and government underlie the assumptions of a macroeconomic theory, since macroeconomists shape their theories with an eye to policy formulation. Economic theories and especially macroeconomic theories can be viewed as providing the rationale for policy proposals that are normative through and through, in spite of being disguised as being entirely positive, e.g., neoliberalism. Therefore, economics presupposes views of metaphysics as the study of what is, epistemology as the study of what we can know about what is, ethics as the study of what we ought to do about what is, and aesthetics as the study of how we should feel about what is, in addition to using science as an empirical method of testable explanation of how things stand and change state, and what this may imply causally. Without a critical approach to economics through the philosophy of economics as a method for clarification of assumptions and other aspects of thought and language that remain implicit, economic reasoning is not only unclear but can also be misleading. For example, there is growing interest in examining the assumption that growth is an adequate criterion for economic progress when it may not be related to happiness. Happiness is an ambiguous concept, so it must be clarified first. On examination, Speth shows, growth as an economic criterion is based on a conception of happiness that well-defined in terms of the survival of the fittest. Therefore, "growth" as a criterion can be determined by GDP change, regardless of distribution. This is the neoliberal assumption that has become conventional wisdom. The problem with this is that the US has the largest GDP globally, but it is the lowest in many key social indicators that involve happiness considered as "utility," i.e., relative material satisfaction. On many measures, the US is not the happiest nation on earth, "American exceptionalism" notwithstanding. A key concept of Modern Monetary Theory is public purpose. Certainly, this must relate to the founding documents, and in particular to key statements from those documents cited above. How then should MMT define itself wrt "the pursuit of happiness"? The neoliberal view is that maximum utility is the criterion of action, presuming homo economicus to be a rational actor pursuing self-interest and capable of being modeled econometrically in terms of a representative agent. This is presumed to be self-evident, but it is contradicted by research in both cognitive and social science, as well as having been dismissed as actually irrational by thinkers for millennia because it overlooks the inherently social nature of human beings. Maximum utility is based on methodological individualism. It is called "methodological" because the assumption of self-interest as the guiding principle of human motivation is a methodological presumption. However, this presumption is often if not generally presumed to be ground in ontological individualism, that is, that individualism is constitutive of human nature. Some economists leave this implicit, while others, especially the Austrian School, make it explicit. Others claim that such presumptions ignore society as a complex web of relationship, involving interdependence in modern societies, and now global society. This is called "community," and it is the meaning of "fraternity," in the Enlightenment political ideal of "liberty, equality and fraternity." Now "fraternity" is called "solidarity in Europe. Modern Monetary Theory based itself on a broader view of methodological individualism than neoliberalism or Austrian economics, in that it agrees that individuals are the elements in complex social system, and explanation must be ultimately grounded in causal mechanisms that stem from individual action. However, it accepts that other factors are at work in shaping individual decisions other than rational self-interest as generally conceived by methodological individualism that presumes ontological individualism. Ontological individualism is an oversimplification of human complexity. According to MMT, the purpose of government is public purpose, that is to say, government is to serve the public interest rather than dominant private interest groups. The public interest is distributive. Economic happiness is only one aspect of human happiness and it involves prosperity. Microeconomics is about prosperity of households and firms, whereas macroeconomics is concerned with the prosperity of entire societies and in the age of globalization, with global prosperity. At the macro level, prosperity is necessarily distributed. Public policy is about achieving this distribution through government pursuit of public purpose, which complements the pursuit of private purpose by individuals and interest groups, such as firms. The end of Ponzi financing era in the United States and the World – When income, revenues, and swindles no longer support servicing debt. From California home owners, Greek bondholders, and Japanese zombie banks. We went from normal finance in housing (that is paying for the mortgage with current income), to speculative finance (where paying for the mortgage was based on cheap financing tools and projected incomes), to Ponzi financing where current income was unable to pay for even the servicing of debt. This is Hyman Minsky's financial cycle. No matter how you slice it, the era of Ponzi finance is over. Gold?? Ha!!! Treasuries outperforming the yellow metal! The chart below is spot gold divided by the 30-year Treasury price. Gold is tanking! Does positive growth in Q2 or Q3 mean the recession is over? So when we get the GDP report next Friday, we might could (as my grandmother would say) see positive numbers for the change in GDP. Some people will be dancing in the street, proclaiming the recession is over. Hold the phone on that one though, because you’ll know that it doesn’t really mean anything until it is confirmed by the other four metrics that we should be watching. Robin Koerner, publisher of WatchingAmerica.com, addresses the balance budget amendment in light of MMT's warning about what it would entail economically. It seems to me that Koerner presents the tradeoff pretty well. What he is saying is that most people calling for a balanced budget amendment don't realize that everything has consequences and they don't understand the political benefit that is supposed to result has an economic cost, even a serious one, in the tradeoff. He piece is about the political/economic tradeoff, and he things that the decision criteria should be normative. He sees it as a tradeoff between prosperity and tyranny and comes down against tyranny. That appeals to a lot of people both on the right and left in this culture of crony capitalism and corruption, in which the state is seen increasingly as predator. He understands the basic points of MMT about the fiscal balance and then considers the tradeoff in terms of government power. This and his previous post show that he has at least taken the trouble to investigate MMT. That's a plus, since we are at least engaging on a playing field where our existence is being acknowledged. Moreover, he is objecting to MMT not on positive grounds, which he seems to have conceded, but on normative preference. That seems like an advance for MMT to me, rather than having to confront ill-informed blather. The main objection of both left and right to MMT policy is that it gives politicians too much power in its attempt to offset saving desire with fiscal policy through the sectoral balance approach and functional finance. The right is concerned with politicians using fiscal power to bribe the rabble for votes, and the left is concerned with state capture as the wealthy and influential bribe politicians with contributions needed in increasingly expensive campaigns. Koerner makes clear that his concern is not economic as much as political. He cautions that there is a tradeoff between economic concerns and political concerns, and that a balanced budget amendment would have consequences that MMT warns about. I don't that this can be shrugged off politically. This is why the work that Bill Black and Randy have been doing on the blogs is addressing corruption is so important, and why proposals for reform like Warren has put out are key to putting the MMT position across politically as well as economically. I have also brought up the input of Michael Hudson on economic rent, which MMT hasn't dealt with specifically as far as I can tell. But this is a good argument for progressive taxation that distinguishes productive and unproductive gains and taxes the unproductive. MMT does talk about targeted taxation, and this is what progressives are looking for to address inequality. Soros reiterated his view in a panel discussion in Vienna that the euro had a basic flaw from the start in that the currency was not backed by political union or a joint treasury. "The euro had no provision for correction. There was no arrangement for any country leaving the euro, which in the current circumstances is probably inevitable," he said. While he called survival of the European Union a "vital interest to all," he said the EU needed structural changes to halt a process of disintegration. This has been the MMT view since the inception of the EMU. So YoY for the 3 months ended May, the fiscal deficit has decreased by $103B (367B to 264B), due to a increase in deposits (either tax receipts, or perhaps the Fed refunding it's outsized "profits" due to QE to Treasury this year), as net withdrawals (spending) are actually down, nominal, by $22B, YoY for these same 3 months. Total loans and leases (TLL) in bank credit rose by $9B over this same 3 month time period this year to $6,725B, but at the end of May 2010, total loans and leases stood at $6,893B, so hard to tell what TLL did YoY for the 3 months ended May, but we at least can see that TLL have collapsed by $168B (that's baaaaad) YoY for the year ended May. With TLL still contracting YoY, and total government spending down $22B, it looks like we are looking at a negative GDP number for these 3 months, unless net imports have decreased by a greater amount. This is pretty bad when the best thing we can look forward to is a hope that we imported less to get us some US GDP "growth". The Bureau of Economic Analysis (BEA) revised their estimate of the annualized growth rate of the first quarter 2011 U.S. Gross Domestic Product (GDP) up slightly to 1.92%. This is their third and final regularly scheduled estimate of the first quarter's growth rate, although sweeping revisions of prior estimates can occur at the end of each July. Notably, the one creditor that was paid back in full — in 2006 — was the International Monetary Fund, to which Argentina owed $9.8 billion dating to the 1990s. A lesson for Greece is “whereas the commercial creditors are expected to take a haircut, the official creditors like the I.M.F. are not willing to,” said Robert S. Koenigsberger, chief investment officer with Gramercy, an emerging markets investment manager. “That is how commercial creditors get subordinated and bear the brunt of these failed bailouts,” Mr. Koenigsberger said. Since paying off the International Monetary Fund, Argentina has not borrowed from the fund. That has enabled the Kirchner governments to avoid the agency’s typical prescription of cutting state spending. For one thing, a decade later, Argentina has still not been able to re-enter the global credit market. “A default is not free,” said Jaime Abut, a business consultant in Rosario, a city north of Buenos Aires. “You have to pay the consequences, and for a long time. Argentina is no longer considered a serious country. I was really struck by the person who said that Argentina is no longer considered a serious country; shouldn’t that be a Serious country? And in Argentina, as elsewhere, being Serious was a disaster. To reiterate, none of this discussion applies to truly sovereign nations who never face any solvency risk. I think the best thing a non-sovereign government can do in terms of advancing the interests of its people is to move towards sovereignty as soon as possible. That might involve jettisoning a currency arrangement (such as in Latvia, for example). It might require exiting a monetary union that has taken the currency-issuing monopoly away (such as the EMU nations). In this instance, that might necessitate a formal default on all debt that was incurred in the currency that the nation is exiting (such as Greece at present). The reality is that a sovereign government holds all the cards in this situation. Please read my blog – Why pander to financial markets– for more discussion on this point. There would be short-term costs but by re-establishing the currency sovereignty the nation will always be able to advance the best interests of its domestic economy. This doesn’t mean that a nation that is short of real resources etc will be able to establish a high material standard of living by moving to sovereignty. The real standard of living is always determined by the access a nation has to real resources. Fiscal policy does not create these resources but can ensure they are more fully utilised and thus more effectively deployed. A poor nation will not become rich just because it is sovereign. I've been doing some "lite" reading lately on the US International Transactions Accounts (ITAs), trying to increase my understanding of how the Commerce Department's Bureau of Economic Analysis (BEA) compiles their reports that document these cross-border economic flows. I found an interesting document at the BEA website that is a good top level overview of these reports. You can access the .pdf file here. These BEA ITA reports cover the US balance of trade in the Current Account, as well as foreign purchases of US financial assets (such as Treasury Securities) in the Financial Account. Fear mongers tell us often that (cue 'The Prospector') "We're borrowin' from the Chinese! ", where we in the MMT paradigm would say rather that the Chinese are simply purchasing USD financial assets with the USD balances they accrue due to their outsized trade surplus with the US. Who is right? Perhaps we should go to a neutral party to rule on this disagreement? Would the US BEA, the official government agency that maintains the records of these transactions qualify as an objective, unbiased authority on this topic? I would say so. So there you have it, right from the US Government official source of all the data that is the subject of all the "controversy". Let me repeat: "For each credit entry there MUST be an equal and offsetting debit entry (I hope you saw the word "must" and know what it means). So here is the "T-account" breakdown according to the BEA; Chinese trade surplus: DEBIT, corresponding increase in Chinese owned US liabilities: CREDIT. That's all folks. There is no "borrowing" or "lending" involved here. These are not my opinions, or Mike's opinions, or Tom's or John's or Kevin's opinions; or any of the MMT thought leader's opinions. This is a statement of fact promulgated by the US BEA. Someone needs to tell former tax collector extraordinaire Rep. Michele "Hu's Your Daddy?" Bachmann that the official US government agency in charge of maintaining the accounting for international transactions, (btw an agency that she approves the operating budget for via Congressional appropriation) disagrees with her moron description of international accounting transactions. “We are being asked by the Obama Administration to approve a debt limit increase. While President Obama inherited a bad economy, his overspending and failure to enact pro-growth policies have made it worse and now our national debt is currently more than $14 trillion. House Republicans have made clear that we will not agree to raise the debt limit without real spending cuts and binding budget process reforms to ensure that we don’t continue to max out the credit card. One option to ensure that we begin to get our fiscal house in order is a balanced budget amendment to the Constitution, and I expect to schedule such a measure for the House to consider during the week of July 25th. I have no doubt that my Republican colleagues will overwhelmingly support this common sense measure and I urge Democrats to as well in order to get our fiscal house in order." We knew it was much more severe than they were saying, because radiation was coming out left and right. So in other words, they lied to us. In New York City, you can actually see it in the milk. You can actually see it has iodine, 131, actually spiked a little bit in our milk in New York City, but it is very small. See also Nebraska Nuclear Meltdown? Coverage of Fort Calhoun and Cooper Nuke Power Plant Flooding on the Missouri River for updates from various local sources. Meanwhile, Germany has announced intentions to phase out nuclear power over 11 years. Almost three-quarters of Japanese favor nuclear phase-out. MMT holds that the only actual economic constraint is real resource availability. Nuclear energy has been expected to be a principle contributor to future energy resources with the projected phase-out of carbon-based fuels. Stephen Gordon at Worthwhile Canadian Initiative has some charts up illustrating the balance sheet recession. "The US data go back to 1952, so I was able to check the last time the real, per capita value of US housing equity was at its current level. Even after looking at all of these graphs, the answer astonished me: 1978. Nineteen seventy-freaking-eight." "The protests in Greece concern all of you directly." "I have never been more desperate to explain and more hopeful for your understanding of any single fact than this: The protests in Greece concern all of you directly. "What is going on in Athens at the moment is resistance against an invasion; an invasion as brutal as that against Poland in 1939. The invading army wears suits instead of uniforms and holds laptops instead of guns, but make no mistake – the attack on our sovereignty is as violent and thorough. Private wealth interests are dictating policy to a sovereign nation, which is expressly and directly against its national interest. Ignore it at your peril. Say to yourselves, if you wish, that perhaps it will stop there. That perhaps the bailiffs will not go after the Portugal and Ireland next. And then Spain and the UK. But it is already beginning to happen. This is why you cannot afford to ignore these events." By Alex Andreou, a successful lawyer turned actor living in London. "Nassim Nicholas Taleb is the Lebanese-American philosopher who formulated the theory of “Black Swan Events” – unpredictable, unforeseen events which have a huge impact and can only be explained afterwards. Last week, on Newsnight, he was asked by Jeremy Paxman whether the people taking to the streets in Athens was a Black Swan Event. He replied: “No. The real Black Swan Event is that people are not rioting against the banks in London and New York." Edward Harrison of Credit Writedowns has an explanation for Bill Gross's seemingly contradictory views about the need to reduce the deficit and his call for instituting a job guarantee, which would increase the deficit — and Ed credits MMTer Marshall Auerback for it. BTW, Marshal is a consultant to PIMCO, so it is possible that he is the source of Gross's position. When the private sector is not willing or able to step up to the plate, then government has to. Ed points out that, moreover, just increasing aggregate demand through stimulus is generally politically co-opted, channeling the stimulus to the influential rather than toward creating effective demand. Good write up by an Alex Andreou that was cross posted at Naked Capitalism on the current economic injustice and needless social stress that is being inflicted on the citizens of Greece. Link to the post at NC here: "Democracy vs. Mythology". He includes some empirical economic data that may dispel some of the propaganda and stereotyping that has been perpetuated by the MSM about the economy of Greece being "sub-par". Money is a commodity, invented to help people by facilitating transactions. It is not wealth in itself. Wealth is natural resources, water, food, land, education, skill, spirit, ingenuity, art. In those terms, the people of Greece are no poorer than they were two years ago. Neither are the people of Spain or Ireland or the UK. And yet, we are all being put through various levels of suffering, in order for numbers (representing money which never existed) to be transferred from one column of a spreadsheet to another. Right on Alex! This guy gets it, let's hope his wisdom is contagious. Edward Harrison of Credit Writedowns explains QE1, QE2, and QE3 from the Fed's announced perspective and his own views, which is consistent with MMT. What are the differences between, QE1, QE2, and QE3? Ed thinks that should QE3 come, it will be after the Fed has firmly established the the overnight rate at zero, when it will shape the yield curve by setting price rather than quantity, reversing the strategy of QE2. If this happens it will be completely in line with MMT's position that the government controls interest rates as it chooses, and the natural rate of interest (overnight rate) is zero. While this is admittedly an emergency measure, it demonstrates what MMT has been claiming as a feature of the federal government's monopoly power as issuer of a nonconvertible floating rate currency. Truthout posted an excerpt from Robert Reich's new book, Aftershock. It tells the story of Marriner Eccles, chairman of the Fed Marriner Eccles, who served in that capacity from November 1934 until April 1948. If you are not familiar with the story, it's a good, short read. Eccles arrived at these ideas not by any temperamental or cultural affinity—he was, after all, a banker and of Scottish descent—but by logic and experience. He understood the economy from the ground up. He saw how average people responded to economic downturns, and how his customers reacted to the deep crisis at hand. He merely connected the dots. Libertarianism and the Tamerlane Principle. "This is why modern American libertarianism is so very, very flawed. The ideology professes to value liberty above all else, but it ignores the dynamic aspect. There is liberty today, and there is liberty tomorrow. Sometimes violations of liberty today (such as an income tax) are necessary to protect the body politic from far, far, far more heinous violations of liberty tomorrow". "Most libertarians recognize this, and freely admit that defense is an exception to the "small government" rule. But an army is not going to be a very effective Tamerlane repellant without a large GDP and advanced technology to back it up. And what modern American libertarians either fail to understand, or refuse to accept, is that public goods are essential for a high GDP." Austrian School advocate Robin Koerner attacks MMT in an article written for the Huffington Post. "First of all, the system described by MMT, while real, is obviously utterly unconstitutional. Second, (as the MMTers admit), the supply of money in the private sector remains critically important as inflation is the monster that must not be unleashed (and the Austrians know all about that). Third, everyone other than the government still use fiat money in creating the economic dynamics of the nation in a way that the Austrians best understand. And fourth, and perhaps most importantly, government cannot merely spend money into the private sector without choosing where and how to spend it. And any such choice removes spending power from private citizens and redistributes it just as surely as in the days when the likes of Hayek and von Mises, two of the greatest thinkers in Austrian economics, were doing their best work. Put simply, while MMT offers extraordinary insights into aggregates, no economic decision ever affects only an aggregate". “First, I will veto any spending bills that contribute to an unbalanced budget." “Second, I will veto any spending bill that contains funding for Planned Parenthood, facilities that perform abortion and all government family planning schemes. Like millions of Americans, I believe that innocent life deserves protection and I am deeply offended by abortion. It is unconscionable to me that fellow Pro-Life Americans are forced to fund abortion through their tax dollars." “Third, I will direct my administration to cease any further implementation of ObamaCare." TC also mentions the problem of uneven large spreads in different locations. I suspect that these coins are not fungible, because my 9 year old son would be able to rip the faces off of these spreads. The bitcoin is probably closer to a fad than a real form of money. Financial repression is any public policy that is designed to influence the market price of financing government debts, either through government bonds or the nation’s currency. Direct methods of repression include things like setting target interest rates, monetizing government debt or implementing interest rate caps. Indirect methods include polices designed to change the amount of debt or currency at a given price. Examples include requirements to hold minimum amounts of government debt on bank balance sheets or establishing minimum requirements for government bonds in pension funds. It is important to realize these methods as practiced are only partially effective and cannot go on forever, as advanced economies continue to add significantly to their public debts despite low financing costs. Some intensification of financial repression, fiscal austerity, or stronger growth must occur to lower the likelihood of a future debt crisis. Scott A. Mather, PIMCO Economic Outlook, Game Change for Bond Investors? 1. "Governments practicing financial repression may be transferring wealth from creditors (citizens [bondholders]) to debtors (governments) to the detriment of creditors, fixed income investors and savers [rentiers]." Bond holders are clearly upset by the prospect that QE3 (if it comes about) will target price instead of quantity, thereby capping interest rates. Fed bond purchases also transfer the interest on those securities to government, reducing the non-government net financial assets that would have accrued. PIMCO is apparently concerned that Bernanke has figured out how to neuter the "bond vigilantes" by taking control of interest rates along the yield curve, a control that naturally falls to government as the currency monopolist. 2. "It is important to realize these methods as practiced are only partially effective and cannot go on forever, as advanced economies continue to add significantly to their public debts despite low financing costs. Some intensification of financial repression, fiscal austerity, or stronger growth must occur to lower the likelihood of a future debt crisis." Mather does not seem to get that sovereign debt crisis is an oxymoron for countries like the US that are monopoly providers of a nonconvertible floating rate currency. This also accounts for the hissy fits that Bill Gross has recently been throwing. Obviously, this will not "go on forever." It is an attempt to turn the economy around, although perhaps a misguided one, or else a hail mary pass since Congress refuses to act fiscally. But it won't end because "it can't go on forever." The Fed already sets the overnight rate, and there is no contradiction in its setting the yield curve, too. "You don’t need a weatherman"
To know which way the wind blows"
"Media reports often fail to connect recurring demonstrations in Greece and Spain with those in the Middle East and North Africa (Tunisia, Egypt, Syria, Yemen, Libya, Bahrain). After all, the MENA demonstrations are ostensibly about democracy, while European countries already have functioning electoral systems. Protestors in Greece and Spain are instead decrying austerity programs resulting from governmental efforts to rein in deficits and debt burdens. "At the core, though, all of these uprisings are about the simultaneous failure of modern economics and modern politics—even though systems differ somewhat from country to country. People in all of the nations mentioned have one thing in common: crushed expectations. Economists and politicians have promised jobs and growth, but instead citizens are seeing spreading unemployment, rising food and energy prices, and increasing economic inequality. Nowhere are there realistic prospects for a political remedy to worsening economic conditions. Thus, while unrest seems destined to spread and intensify in the months and years ahead, it has no clear long-term strategy or goal..."
Richard Heinberg makes the case in Energy Bulletin, Post Carbon Insitute that this is not only a financial crisis, but also a long-term problem involving real resources, especially, dwindling sources of abundant cheap energy that fueled extraordinary economic development in contemporary times. Read the rest at Global Youth Uprising: Dashed Hopes, Anger, and Realism. Edmund Conway at The Telegraph makes a case that "Germany - not Greece - has 'destabilised the euro area and is one of the biggest road-blocks to its ultimate recovery" in Why Germany must exit the euro. I agree, although admittedly this may be confirmation bias on my part. By way of disclosure, I have been saying for some time that the problem is Germany and have predicted that Germany will be forced to exit the euro first for political reasons, namely, voters are unlikely to approve the required transfers that only Germany can make in the absence of a fiscal union in addition to the existing monetary one. The problem is the strength of the core, particularly Germany, rather than the weakness of the periphery. Germany's export economy has colonized the periphery and left them without the means to meet their financial obligations to the core's financial sector, which, according to neoliberal thinking, must be protected above all else as the source and allocator of capital. This ends by forcing austerity on the periphery, resulting in social unrest in the absence of a bailout, which Germans consider inflationary if monetary and unfair to them if fiscal. This obviously is not working, and no permanent fix is in sight. Bandaids are not doing it, either. The EMU suffers from poor design, along with a fact that should have been obvious from the outset — Europe is not an optimal currency zone. Regardless of this, the Europeanizers pushed ahead with a plan that did not contain contingency planning for imbalances resulting in distortions and ultimately crisis. If Germany exited, then the Deutschmark would be properly valued in the market immediately and the euro would fall. Now, the euro is undervalued wrt Germany, favoring Germany's export economy, while being overvalued wrt to the periphery, disadvantaging much of the rest of Europe, especially chronic net importers. It is already being said openly that what Germany attempted and failed at in WWII, it is accomplishing financially and economically through Eurozone asymmetry. If the EZ is to work as a currency zone, then either a fiscal union must be established allowing transfers, or else the design must be revisited taking into consideration an optimal currency area. Presently, the economic disparity is creating too great an asymmetry. 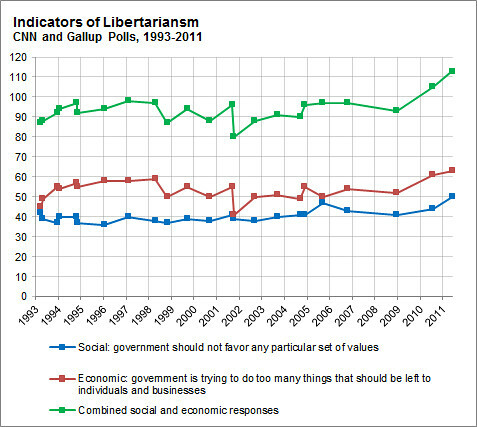 Über-statistician Nate Silver notes that according to recent polling, libertarian views are on the rise, both social libertarian and economic libertarian. As a libertarian of the left this is welcome news to me. But as someone who understands the basics of MMT, along with the scientifically established fact that human beings are primarily social rather than individualistic, it is not all good news. It is good news in that the country is moving past the days when culture was largely dictated by mores of the past. On the positive side for all libertarians, that is, of both left and right, this means that broader freedom and fundamental human rights are being recognized to a greater degree. We don't need politicians in our bedrooms, or government in the doctor's office when we visit. Ignorance of sectoral balances inevitably leads to policy choices that result in economic contraction and loss of financial independence for many as they are forced to draw down savings, sell assets, or borrow to maintain lifestyle, which is unsustainable. Those in the most precarious postion begin to fall into poverty — the opposite of libertarian values. The post, The Austrian School responds to Dr. Galbraith, generated a lively debate and 174 comments. Some of those critical comments requested mathematical and empirical proof of MMT views. UMKC Prof. Randy Wray just posted an overview of his earlier (2002) prediction about what developed into the GFC based on the sectoral balance approach and US data. In it, Randy gives the math — sectoral balances summing to zero — and the empirics — the data for the periods — to show how the MMT view bears out. Randy also points out that the WSJ got it completely backwards at the time, and the mainstream still hasn't figured it out. Now, mainstream economists in the US, UK, and EZ are calling for "expansionary fiscal austerity" based on the same failed ideas, while MMT shows why this will lead to contraction instead. In the game, players receive "bonds", which are imprinted with Macon-inspired icons and symbols, such as peaches, guitars and butterflies. They can then redeem these bonds for notes of Macon Money, imprinted with the face of the town's most famous son, the late soul singer Otis Redding. These notes can be spent at participating local businesses, which the game's organisers reimburse with US dollars. In the case of bailing out Wall Street – and thereby the wealthiest 1% of Americans – while saying there is no money for Social Security, Medicare or long-term public social spending and infrastructure investment, the beneficiaries are obvious. So are the losers. High finance means low wages, low employment, low industry and a shrinking economy under conditions where policy planning is centralized in hands of Wall Street and its political nominees rather than in more objective administrators. Michael Hudson mentions MMT in this post, although he is out of paradigm when he speaks of losses being born by taxpayers or Treasury bonds paid out of future revenues. Most scathing in this acerbic critique is his showing how Michelle Bachman gets the truth of the bailout, whereas the political class either doesn't or is returning the favor to big donors in the financial sector. "Because we think we may be the next Greece, we are turning ourselves into the next Japan." Because we think we may be the next Greece, we are turning ourselves into the next Japan. Obama presides over the greatest wealth transfer to the top of any president in history! Obama promised to help working people. Instead, he has presided over the greatest wealth transfer to the top of any president in history. Look at what has happened to workers's share of national income since he took office. I was talking to Warren Mosler yesterday and he came up with a good way (I thought) of countering the "printing money" line that we often hear. "All government spending is printing money. And all taxation and spending reductions are 'un-printing' money." Bernanke finally gets it that the Fed controls the yield curve? This time the Fed will target price instead of quantity. MMT economists were saying from the beginning that this is what the Fed would have done to control the yield curve. Now Bernanke seem to have figured out that he should be targeting price (yield) instead of quantity (announcing the total projected buy). So what then might the Fed do if its target interest rate, the overnight federal funds rate, fell to zero? One relatively straightforward extension of current procedures would be to try to stimulate spending by lowering rates further out along the Treasury term structure–that is, rates on government bonds of longer maturities. There are at least two ways of bringing down longer-term rates, which are complementary and could be employed separately or in combination. One approach, similar to an action taken in the past couple of years by the Bank of Japan, would be for the Fed to commit to holding the overnight rate at zero for some specified period. Because long-term interest rates represent averages of current and expected future short-term rates, plus a term premium, a commitment to keep short-term rates at zero for some time–if it were credible–would induce a decline in longer-term rates. A more direct method, which I personally prefer, would be for the Fed to begin announcing explicit ceilings for yields on longer-maturity Treasury debt(say, bonds maturing within the next two years). The Fed could enforce these interest-rate ceilings by committing to make unlimited purchases of securities up to two years from maturity at prices consistent with the targeted yields. If this program were successful, not only would yields on medium-term Treasury securities fall, but (because of links operating through expectations of future interest rates) yields on longer-term public and private debt (such as mortgages) would likely fall as well. Bitcoin in trouble in the US? Is Goldman TBTP (Too Big To Prosecute)?